Julia Pimsleur was angry. The statistics on women’s business success – only 4% of venture capital goes to women-run businesses, and only 3% of all women entrepreneurs ever reach $1m in revenue – appalled her and she thought someone should do something about this. It was something of a shock to realise it was going to be her. When you write a book, it’s almost like having a baby. You have to then be open to all the life changes that come about with it. Julia’s passion is inspiring, and anyone, particularly any woman, struggling with that common feeling of ‘not enough’ needs to hear about how Julia overcame this in both her business and her book. Alison Jones: Hello and welcome to the Extraordinary Business Book Club. I’m delighted to be here today with Julia Pimsleur, who founded Little Pim, the leading system for introducing children to a second language, and who is now on a mission to help 1 million woman entrepreneurs get to 1 million in revenue by 2020, and particularly by educating them on how to raise capital and to think big. Hello, Julia, welcome to the Extraordinary Business Book Club. Julia Pimsleur: Hello, Alison, delighted to be with you today. Alison Jones: It’s great to have you here. I love this bold, personal mission statement. Now, your book, Million Dollar Women, is very much linked to this. Can you tell us a bit more about how that 1 million women to 1 million dollars revenue idea came about? Julia Pimsleur: Absolutely. I wrote my book because I got mad. I got mad about 2 things. It was while I was running my business, Little Pim, which was language teaching for young children. I had been running the business for several years and went out to raise venture capital to scale up my business, not realizing that this was a tremendously hard thing to do. At that time, I stumbled on the first statistic that made me mad, which was that only 4% of all venture capital, which if you’re not familiar with that term it’s the big bucks, this is big dollar investments. Only 4% of all venture capital goes to women-run business. Julia Pimsleur: Right, how can that be this tiny little number? That was a tough pill to swallow, especially as I was gearing up to go raise venture capital, and thought, “All right, I’m going to have to be twice as good now because only 4% of us get funded.” The second statistic was that only 3% of all women entrepreneurs ever reach 1 million dollars in revenue. If you’re a business owner, you know that reaching a million in revenue isn’t even like you put your feet up and go home, that’s just getting off go in the business world. I thought, “How is that possible that so few of us are hitting this mark?” The statistic is double for men, 6% of all entrepreneurs get to a million in revenues, but only 3% of all women. When I first heard the stat, it was actually 1.8%. Yeah, it’s grown a little bit over the last couple of years. Those 2 stats, the 4% and the 3%, to take the current one, just made me feel like, “Okay, something has to be done.” It took a little while to realize I was the one to do it, but we can talk about that too. Julia Pimsleur: Well, I was reluctant. I have 2 little boys who are the lights of my life and I was running my business, which I had been running for some 7 years, very full-time activity, and raising venture capital. I really did keep thinking, “Well, somebody has to tackle this. This is not okay that in 2000, whatever it was at the time, 13, 14, that there are these horrible statistics for women.” I’ve always been very driven by social justice issues, I was a documentary film-maker for a while, I was a non-profit fundraiser, entrepreneurship is actually my third career. That stayed moot for a little while. Then, I realized, why not? Really, what did I have to lose? I think it was Brené Brown’s book that really put me over the edge, it was Daring Greatly. Have you read that Alison? Alison Jones: I have, it’s so inspiring, isn’t it? I stopped and thought about, “Wait a minute, I’m running a 7-figure business. I worked my tail off to get here. I’ve learned so many things.” I wished that I’d had female role models along the way, and I didn’t have them. I had many male mentors, heard incredible speakers on the entrepreneur circuit, but almost no women. I decided, you know what, let me write a book that’s not from the top of Mount Everest. Not Arianna Huffington, and Sara Blakely, and Martha Stewart, and the people who’s stories we read about all the time in the press. Let’s write a book, I want to write a book about the women who are at what I call Mount Everest base camp. Which is like, you know how high up Mount Everest base camp is? Alison Jones: It’s pretty damn high, isn’t it? Julia Pimsleur: It’s 18,000 feet. Not everyone gets to Mount Everest base camp. Those are the stores I wanted to tell, because I was there, running a 7-figure business and there were thousands of women around the country and around the world who’ve made it there but no one had yet gathered their stories to share this information with the women that are starting their climbs. Being mad, realizing I am enough, and wanting to tell the stories from Mount Everest base camp is what got me off my tuckus to write this book. Alison Jones: Brilliant. That’s 3 really powerful things coming together. I love that thing about you got angry and that’s the fuel to just get up and do it. The stories are such a key part of the book and they really struck me… You’ve got these featured stories from a really wide variety of women. How did you go about pulling those together? Julia Pimsleur: I knew I wanted to profile 7 to 10 women from across the country in different industries, different ethnicities, different phases of their life as women. I think some of the questions we don’t get ask very often as ambitious women, it’s like, “How is this all going to fit together with the rest of my life?” Now that I did write the book and I am out on the speaking circuit, I get these questions from largely millennial women who say, “I have all this ambition and drive, but I also want to have a family.” The fact that they even have to say but in that sentence kind of breaks my heart. I did want to find women who had children, women who had decided not to have children, the whole range. I spent a good part of a year researching these women because, by the way, their stories are not in the press. I couldn’t just Google ‘women who have 7-figure revenue businesses’. It did take a lot of digging, but I’m really excited about the women I was able to interview and present in Million Dollar Women. Alison Jones: One of the things I often talk to my clients about is the way that a book builds your network and your relationships. You can be quite strategic about that. I’m guessing that you’ve made some really good friends out of this. Julia Pimsleur: That’s a great point. I keep running into, now, some of the women who I profiled, 2 or 3 of them are in New York. Then, some are on the West coast, some in the middle of the country. I’m now putting together my first Million Dollar Women’s summit, which is going to be a gathering of 200 high-growth women entrepreneurs here in New York, in March 2017. I’ve invited all the women I profiled in my book to come speak on a panel. That was fantastic, to be able to circle back and pull them in in yet another way. Alison Jones: Yeah, fantastic, because those relationships go on, and on, and on, don’t they? Alison Jones: Everybody loves being involved in a book, there’s something about it, isn’t there? It’s really powerful. Alison Jones: Well, you can do that. I’ve done enough edited collections in my time, they have their own problems, believe me. Julia Pimsleur: Alison, I’m so delighted that you talk about the process of writing the book, because I found that to be a whole new uncharted territory for me, just to figure out how to get this thing done. Alison Jones: Where did you start and how did it happen? Julia Pimsleur: I’m a big reverse engineering type so I like to figure out, okay, what is the end game? Then, how do I get there the quickest and who has figured out how to do this in a really great way, and how do I copy them? That’s my strategy in business and in life. I did ask my literary agent, I had a literary agent, I decided to go the traditional publishing route. I considered self-publishing but realized I really wanted the support, largely because of things I mentioned before of running a 7 figure business, I had 2 little boys at home. I just didn’t have time to do the whole thing on my own, and because I wanted this to be the beginning of a movement and to be a platform for me, I knew having a publisher would probably help with that, and it has. With my literary agent, she put me in touch with some ghost-editors, I didn’t have a ghost-writer, but I had a ghost-editor. Again, because of the time constraints and knowing I’m a bit of a perfectionist, I had a feeling I would do better writing the book if I knew there was 1 more person who would go in and give it a nice pass. Alison Jones: Yeah, somebody else on the team. Julia Pimsleur: That’s exactly right, for accountability, to have deadlines to send things to her, paying her a chunk of money was a big motivator too. Once you’re paying someone, you get that work done. Alison Jones: That’s so true. Julia Pimsleur: She’s turned into a wonderful friend. I remember we went out for lunch and I said, “Okay, you’ve done this before and I haven’t. How does this work?” She started with the end, she said, “How many words is the book supposed to be?” I can’t remember exactly, I think it was 60,000 or 75,000. Then we just did the math, we backed into it. She was like, “You need to write this many words a day for this many weeks.” I had the summer coming up, which is a time when my kids do other things, go to camp and whatnot so I knew I had a little more availability of time. We just put me on a schedule of X number of words per week, I was going to hand them in, she was going to do another pass at it, give it back to me, and we were going to get this draft in by Labor Day. Alison Jones: Brilliant. Do you think you’d have done that on your own? Julia Pimsleur: Oh, I like to think I would have. It doesn’t mean I would have. Alison Jones: How did you fit it into your life? Where were the writing spaces in your day? Julia Pimsleur: As any entrepreneur knows, as soon as you make plans for things to go smoothly, that’s when it all falls apart. This book was no different. I had this lovely plan of, “It’s going to be the summer and I’ll work from home in the mornings from 8 until noon, and then I’ll go in and spend the second half of the day at Little Pim, and won’t that be wonderful?” Right then, we hit a huge obstacle in Little Pim and we had a cash-flow crisis, and things were falling apart, and there was no way I could work from home even 1 morning a week. That was like, forget it, that’s out. That was tough, because I already had a contract, and an advance, and this ghost-editor lined up. The train had left the station. I was like, “All right, I’ve got to find this time somewhere else.” Here’s how I did it. I set my alarm every morning for 5:00 AM and for 37 days, because we figured out that was the amount of time I needed with the ghost-editor, I got up at 5:00 AM and I wrote from 5:00 AM to 7:00 AM, 2 full hours totally interrupted. Then, I turned off the computer and I went to yoga from about 7:30 to 8:30 AM, and then I went into work and had my usual workday. In 37 days, I was able to write the first draft to the book like that. Alison Jones: Awesome. Did you enjoy it? Julia Pimsleur: I did. It’s interesting, in retrospect that sounds kind of miserable, right? To get up at 5:00 AM. Alison Jones: No, I do this too, I love the morning. I love that quiet space, yeah. Julia Pimsleur: Oh, good, I’m glad. When you’re a morning person it makes sense. Although now, I’m back to 6:00 AM, 5:00 AM is a little early for me. I will say that because my why was so strong, why I was writing the book, I actually, I only remember about 1 day when the alarm went off thinking, “Really? Do I have to?” It was probably a morning after I had too many drinks with a friend. Most days I actually did spring out of bed and was super excited to have this time because I always had my reader in mind. Frankly, my reader was me. I had felt so lost and so wishing I had this kind of advice and inspiration when I was getting my business to 7 figures that I think that is really what got me through. I’m a big fan of the expression that if your why is strong enough, then you will find the how. Alison Jones: Yeah, absolutely. What did you discover about yourself? What did you discover about Julia in that process of writing? Julia Pimsleur: I think, for me, there was a big realization in the process of writing, that I am enough. As Brené Brown talks about, it’s very hard for us somehow, as women, I won’t speak for anyone else, I’ll just speak for myself, to think what I have to say is valid and deserves to be written, and deserves to be read, heard. I have something to contribute. I don’t think that I fully owned that until I wrote the book and realized I had gone through a lot of things that could be useful to other people and felt very motivated by the idea of sharing my story, and if that could help 1 person, 10 people, 1000 people, a million people, then, all worth it. 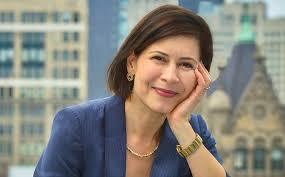 Julia Pimsleur: We throw up 100 roadblocks and get in our own way. Alison Jones: Right. The fact that you had A, done the work, and then B, consolidate the work by writing a book I think is a really interesting double reflection on overcoming that. Julia Pimsleur: Thank you, Alison. Yeah, that’s well put. I would also say that you mentioned the mantras in the book [when we were speaking offline] earlier and that’s basically a visual representation because I worked with a very talented artist, Heather Williams, to do the artwork for the book. She drew these marvellous Wonder Woman cuffs, because I had this vision when I was talk to all the women across the country who were able to build these 7 figure businesses from scratch, and it was not easy. They had to really get through some tough, tough times. We all liked this notion of the cuff bracelets that Wonder Woman wears, it’s sort of kitsch but it worked for all of us. Julia Pimsleur: You got it? Julia Pimsleur: That’s so funny because when we think of Wonder Woman, we think of her lasso, and her invisible jet, and all this, but few people talk about these cuff bracelets, where when she crossed her arms in front of her, they created this force field that could repel any enemy. Alison Jones: Of course. Yes, I hadn’t thought about that. Brilliant. Alison Jones: On your website you’ve got the opportunity for people to submit their own mantras, what they’d have on their own cuffs, which I thought was great. How did that come about? Julia Pimsleur: Oh, thank you. Yes, women have been writing in from all over the country and all over the world. The book actually came out on 5 continents, so I have people writing in from Australia, and the UK, and the Netherlands. It’s been so exciting to hear from million dollar women all over. What I did was I put these 10 sayings that we all felt were the things that got us through the tough times, as million dollar women cuff bracelets. It makes sense when you go to the website, it’s JuliaPimsleur.com, just my name dot com. Then, under the book, you’ll see the 10 cuffs. It’s things like, “Have the fear and do it anyway. To go big don’t go solo.” My personal motto in life now, which is, “Fortune favours the brave.” When you’re having one of those days where it’s like, “Nothing is working.” Or you just need a little extra boost of courage, it’s nice to know that there are women around the country, and really around the world, who share these same struggles and are there with you. Alison Jones: I think we need to … This is a product idea, you need to actually create these in gold things that you can put on and stand in your power pose and recite them. Julia Pimsleur: Wear your big cuffs. Spoiler alert, we have been selling them. Alison Jones: Brilliant, glad to hear it. Julia Pimsleur: It’s a little bit under wraps. I’ve been sending them to the million dollar women who have taken my online business school. Eventually that’s another project to scale up. That’ll have to be another 5:00 AM get up. Alison Jones: This leads me on to the next question, really, which is about how the book integrates into the business that you’re building now, post Little Pim? Tell me a little bit more about, you’ve obviously got the exercises in the book which you can download on the website, you’ve got the mantra cuffs, you’ve got that opportunity to share it. How does the online-offline, book-website business hook-up happen? Julia Pimsleur: Sure. 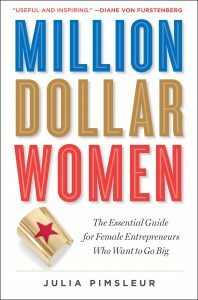 The subtitle of the book is The Essential Guide for Female Entrepreneurs Who Want to Go Big. My mission with Million Dollar Women is for women to read the book and then take the principles and put them into action in their own business. They can do that through the exercises in the book, that’s a good place to start, or they can come to the website, find a lot of free resources about how to fund-raise, where to fund-raise, which are the women-friendly funders. That’s all for free on my site. As well as a million dollar women assessment where they can assess which skills they need to work on in order to get to a million in revenues faster. That was the beginning. After a few months of just having those resources out there, I started getting a lot of requests for one-on-one coaching. I’m all about scalable models, that’s really what I’m trying to teach women, because one of the reasons so few women get to a million in revenues is that we often we don’t build scalable businesses. I decided to practice what I preach, and rather than take on a number of one-on-one coaching clients, I do have a few, I built an online business school for women called, Million Dollar Women Masterclass. I’ve been having so much fun with that because I’ve had women participating in it from all over the country, and from other countries: Australia, the Netherlands. It’s just been so gratifying to build this community of women who are aggressively growing their businesses and seeking this kind of community. Alison Jones: I love the sense that actually what came out of this was this community. The women just kind of come out nowhere and here they all are engaging with it. I love that. Alison Jones: Was that always part of the plan? Or is this an evolutionary strategy that once you have the book it takes you new directions? Julia Pimsleur: No, I’ve been following the book as it evolves. I didn’t really have a master plan. I knew I wanted to help women grow their businesses, but my mission of helping a million women get to a million in revenues by 2020, that evolved after the book came out. I have felt on a mission, or a calling, to write this book, but I didn’t know where it was going to take me. As a very type-A, planned person, that’s been almost the hardest part. Alison Jones: It was almost incidental, wasn’t it? Right from the start, you wanted the speaking and the book was a means to get the speaking. Then, the book has kind of taken on a life of its own. Julia Pimsleur: It really has. I even made the decision to leave the CEO role of my company. I had been running my company for 9 years, the book came out about 8 years into that, and the response that I got from it and realizing that I really had a vital role to play in helping more women scale up their businesses, inspired me to find a new CEO. We have a wonderful new CEO, she’s running the business and doing a great job. I’m still founder, I’m still on the board, but I have no day-to-day role so that I could clear the space to lead this charge along with so many other amazing men and women who are helping, I’m certainly not the only one working on this, there are a lot of great players in this space. I haven’t seen very many women role models coming from base camp. That’s the unique niche that I’m trying to fill. Alison Jones: Yeah, and a really, really valuable one it is too. That’s fantastic. Julia Pimsleur: I’m having a blast, it’s been great. I will say, when you write a book, it’s almost like having a baby. You have to then be open to all the life changes that come about with it, or not, or you resist them. It does create an energy where you’re going to have the universe send various invitations that you then can accept or not accept. When women started contacting me for one-on-one coaching I could have just said, “No, thank you very much. I’m CEO of Little Pim, that’s what I’m doing.” Instead I decided to follow that and I’m so glad I did. I’m having a blast. Julia Pimsleur: I love that. Alison Jones: It’s a great quote, isn’t it? It’s so true, and you can never quite predict how it’s going to happen. Love that. Julia Pimsleur: No and I know we’re both moms, so I’m sure you appreciate the reference, right? When you have your first child it’s like, “Oh, I’m going to do this, I’m going to do that.” Then, the child comes and everything’s different. Alison Jones: They have their own ideas, yeah. Alison Jones: Yes, so true. Listening to this, there are going to be lots of people who are in the throes of writing their first book. What’s the one best piece of advice that you would give to somebody who’s a first time business book author? Julia Pimsleur: I would say stay very focused on your why, because there must be a reason you’re writing this book. It’s a huge pain and a huge lift, even if you enjoy writing, which I do, to get up every day and look at that blank computer, really not easy. You have talked about Gretchen Rubin’s book, well she has several books, but the one called Better Than Before, about changing your habits. Alison Jones: I love that book. Yeah. Julia Pimsleur: It’s a great book, and I know you’ve referenced it here before. This is where it becomes really essential to know which kind of a person you are. She talks about these 4 archetypes of the obliger, the upholder, the questioner, and the rebel. If you are, let’s say, an obliger, which is someone who likes to do things to please others, I guess I must have an obliger side to me because knowing that I had that ghost-editor waiting for the drafts and that I had an editor waiting for the whole manuscript, was hugely motivating to me. If I just had to write it in a void it would’ve been harder. I think that’s a great tool to use. Figure out which personality type you are and then make sure to build the support system that speaks to you. Alison Jones: Yeah, absolutely, couldn’t agree more. Actually, one of the reasons I started this podcast in the first place was because I discovered, rather to my disappointment, I fondly imagined I was an upholder and it turns out that I’m really an obliger. Because I have to report on how I’m doing with my book every week on this podcast, the difference is incredible. Julia Pimsleur: Has that helped? Do you feel more motivated? Alison Jones: Absolutely. Yeah, yeah, yeah. I nearly finished the first draft at the moment, so it’s getting there. Julia Pimsleur: I can’t wait to read it. What is your why, Alison? What’s the why that gets you out of bed at 5:00 AM? Alison Jones: My why is, well, interestingly, because you take the approach of sitting and writing a certain number of words and that worked for you. For me, I see people struggling to write a book as a side project, and I really want them to see it as a living, breathing part of the business. I talk people through what’s the business about and how does the book fit with that, and how can you use the process of writing the book to actually build the business right from the very start? If you’re sitting down to write 500 words, and you obviously can do this, you can get up at 5:00, you can write your 500 words, job done. A lot of people find that really hard. If you’re sitting down, you sketched out what your book is going to be and you can say, “Okay, today I’m going to write this part of chapter 2, which is going to be a talk I’m going to give on Tuesday.” You really embed it deep into the business, then A, you’re much more likely to get the thing done and B, you’re getting feedback, you’re seeing how the thing lands the whole time, and C the book is actually working for you. It’s building the business day by day. That’s my … I just think that’s a really exciting way to write a book and very few people seem to have to it naturally. That’s my why. Julia Pimsleur: I love that. You feel you’re filling a niche of helping to make that bridge between the writing and the book and their business, right? Alison Jones: Yeah, that’s my theory. Julia Pimsleur: It kept coming back. It was like a basketball that wouldn’t land in the hoop, it just kept bouncing back. What was the good part of that is was it bought me a little extra time to think about the business piece of what this next iteration was going to be. I did build the JuliaPimsleur.com website and I built into it some tools that I could then refer to in the book, for instance the Million Dollar Women assessment. Had I not built that already, I couldn’t have suggested women go take the assessment in the book. There is a reason to carve out time during your book reading to thinking about, how are you going to leverage this book when it comes out? What are your ways of monetizing it? Is it just going to help you get speaking gigs or is going to push people to a special landing page? Thinking that through is really important. Alison Jones: Absolutely. I try to encourage people to do that maybe upfront, rather than when it’s in production. Julia Pimsleur: Reverse engineering, to follow my own advice, right? It should be done upfront, indeed. Alison Jones: Brilliant. That’s great advice, thank you for that. You’re not the first person to have said that but you’ve done it very, very articulately. That focus on the why because that is what is going to get you through what is an incredibly long process. Julia Pimsleur: It sure is. Alison Jones: Now, I always ask people on the show to suggest someone else that they think they would be really interesting to interview. Somebody with something interesting to say about the business of business books. Who do you think would be good for me to talk to? Julia Pimsleur: Oh, I can think of so many people. I think someone who is writing her first book and would have a lot to share with your listeners is Tiffany Dufu, who works at Levo League, which is a big mentorship organization for women in the business world and some entrepreneurs. She wrote a book called Drop the Ball, which is about highly successful professional women trying to juggle everything and how sometimes you actually have to let yourself just drop one of the balls. You can’t be the perfect wife, mother, professional and that we still haven’t sorted out this issue, even in 2016, for ambitious women who are trying to live full lives where they’re a major actor in all of these different roles. I’m really excited for her book. She’s an incredible speaker and thought leader, and a friend here in New York. I recommend Tiffany Dufu. Alison Jones: She sounds like somebody I need to talk to, to be honest. Yes, love that idea. Thank you. Julia Pimsleur: Yeah, TiffanyDufu.com for your readers. She already has information up online. I think her publisher is Flat Iron, if I’m not mistaken. The book will be out in February. Alison Jones: Awesome, thank you. That’s great timing, so we can get her just before it comes out. Brilliant. Thank you so much. If people want to find out more about your, Julia, or about the book particularly and about you and the business, where can they go? Julia Pimsleur: I’d love to hear from them. It’s my great joy to hear from entrepreneurs all over the world. I’m at Julia Pimsleur.com. If you forget that for whatever reason, you can just look up Million Dollar Women, it’s on Amazon, it’s all over the place, and then I should come up. I’m also very active on social, so Twitter, Facebook, Instagram, mainly. Julia Pimsleur: Oh, I bet there are a lot of Alison Jones, I didn’t think of that. Julia Pimsleur: ‘The Alison Jones’, you are enough, you are fabulous. Forget all those other Alison Jones. I love, love listening to your podcast, I think you have a great voice and I’m so thrilled to be able to spend this time with you and your listeners. Thank you so much for having me, Alison. Alison Jones: It has been so much fun. Thank you much, Julia, there’s so much great stuff there. I’m sure that so many people will be inspired, and encouraged, and actually really actively helped by it as well. The book is Million Dollar Women, it is superb, and thank you so much, Julia. Julia Pimsleur: Great. Look forward to hearing from all of you out there and have a great day, Alison. capital, entrepreneurship, Julia Pimsleur, speaking, women, writing. Bookmark.